Timber stair parts made with softwoods or hardwoods, to match your stairs and balustrade perfectly. From rustic pine to luxurious oak, our woods are all top-class. Fernhill wooden stair parts are designed for large family homes with impressive hallways, as the scale of these parts makes them perfect for creating something grand. 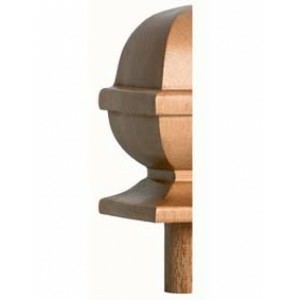 Half newel caps for half newel posts. This square acorn design of newel cap is appealing with a simple but eye-catching design. Half newels and bases fix to walls for a tidy way to finish handrails next to a wall.